On Monday Cabinet authorised a New Zealand deployment to Iraq to assist in the fight against the Islamic State. Around 140 personnel are being sent at the request of the Iraqi Government to take on a training role with their army. They will leave in May once official authorisation has been obtained. There was never really any doubt that in the end New Zealand would join the coalition to help in the fight against the Islamic State when the seriousness of the threat they represent became clear. The beheadings, the burnings, the crucifixions – all staged and published on social media for the world to see – shows it to be a force for evil unlike anything seen in recent times. So what is the Islamic State? What do they stand for? Why are they doing what they are doing? What are they hoping to achieve? And most importantly, how can they be stopped? These are the questions that are on the mind of concerned citizens around the globe. Fortunately, Graeme Wood, a contributing editor of The Atlantic, has long been researching these issues and in a much heralded article What ISIS Really Wants published last week, he has provided many of the answers. By talking to experts around the world, including many Islamic State supporters, Mr Wood has produced a comprehensive outline of the forces that are driving this dangerous movement. The Islamic State, also known as the Islamic State of Iraq and al-Sham (ISIS), is a radical Islamist rebel group under the leadership of Abu Bakr al-Baghdadi. 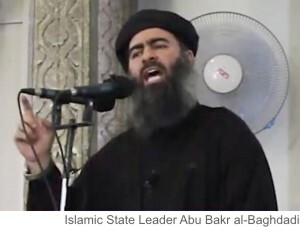 Baghdadi is the third of four sons of a devout Sunni Muslim family in Iraq. After failing to qualify for entry into law at Baghdad University, he turned to Islamic theology, gaining a PhD in 1999. Arrested during the Gulf War in 2004, Baghdadi spent 10 months in the Camp Bucca detention centre in Southern Iraq where he is thought to have joined al-Qaeda. As a “pupil” of Abu Musab al-Zarkawi, the brutal leader who pioneered the practice of beheading hostages and making them wear orange jumpsuits, from 2007 Baghdadi was responsible for providing religious “justification” for acts of terrorism carried out by al-Qaeda under Sharia law. The Islamic State grew out of al‑Qaeda. Baghdadi followed three guerrilla leaders, stepping up in May 2010 with the clear intention of establishing a caliphate – a state led by a religious leader and governed under Sharia Law – and becoming the caliph, or commander. A caliph has to meet certain conditions outlined in Sunni law: he has to be a Muslim man of Quraysh descent, to exhibit moral probity and physical and mental integrity, and he has to have authority over territory in which to enforce Islamic law. By July 5 last year, when Abu Bakr al-Baghdadi delivered a Ramadan sermon in the newly captured Iraqi city of Mosul, he had an area larger than the United Kingdom with 6 million inhabitants under his command. He claimed to have established the first caliphate since the Ottaman Empire, becoming the first caliph in generations. While al‑Qaeda operates as a geographically diffuse network of autonomous cells, to remain a legitimate caliphate, the Islamic State must hold territory and rule it, collecting taxes, regulating prices, operating courts, and administering services such as health care, education, and telecommunications. In addition, full Sharia law must be implemented, obliging Muslims from around the world to immigrate to the territory to live under the law. Some estimate that around 85 percent of Sharia law is in abeyance from the lives of most modern Muslims. Implementing full Sharia law means reviving medieval traditions found in sacred texts – such as slavery, crucifixion, beheadings, stonings, and amputations – that may have lain dormant for hundreds of years. Many of these laws, such as slavery and crucifixion, are extreme, and while Muslims can say that slavery is not legitimate now, and that crucifixion is wrong at this historical juncture, they cannot condemn slavery or crucifixion outright without contradicting the Koran and the example of the Prophet. Once a caliphate has been created, these laws, along with a huge body of other jurisprudence, suddenly awaken, and such laws like crucifixion – which is specified in the Koran as one of the only punishments permitted for enemies of Islam – must be used. If a caliph tries to ‘water down’ full Sharia law, he risks excommunication. The caliph commands obedience – anyone supporting non-Muslim governments is considered to have turned their back on their religion and is subject to death. Shiites (most Iraqi Arabs are Shiite) are also condemned, since Shiism is regarded as innovation on the Koran, thus denying its initial perfection. That means roughly 200 million Shia – along with the leaders of every Muslim country that has elevated man-made law above Sharia – are marked for death. The Islamic State is committed to ‘purifying’ the world by killing vast numbers of people. A ban on the use of cellphones (punishable by whipping or amputation) as well as a lack of objective reporting hides the true extent of the slaughter, but social-media posts suggest that individual executions happen more or less continually, with mass executions every few weeks. Muslim ‘apostates’ are the most common victims. Some Christians are being exempted – as long as they acknowledge subjugation to the new government and pay special taxes. The Islamic State’s propaganda is filled with talk of the apocalypse – when the armies of Rome will meet the armies of Islam in the Syrian city of Dabiq, near Aleppo. Now the Islamic State has taken Dabiq, it is awaiting the arrival of an enemy army, whose defeat will initiate the countdown to the apocalypse. As the masked executioner showing the severed head of the aid worker Peter Kassig said in a November video, “Here we are, burying the first American crusader in Dabiq, eagerly waiting for the remainder of your armies to arrive”. While prophesies refer to the enemy as ‘Rome’, many think that Rome means Turkey, which ended the last caliphate 90 years ago. Others suggest that Rome might mean an infidel army of Americans. In reality ‘Rome’ could be any nation regarded as the enemy. Now that a caliphate has been declared, the caliph must operate an ‘offensive jihad’, waging war at least once a year to expand its territory. Islamic law rejects permanent borders and permanent peace treaties. Should the Islamic State lose control of its territory it will cease to be a caliphate and the oaths of allegiance – including the religious duty for Muslims to immigrate and serve – are no longer binding. The propaganda value of the caliphate would disappear. To keep up the supply of fighters, The Islamic State has reduced the age of conscription from 18 years to 15. Officials are now going through cities like Mosul, which has a population of 1.5 million, conscripting at least one young man from each family. The punishment for those who are not willing to fight ranges from whipping to execution. It is within this context that other nations are seeking to contain the Islamic State through air strikes. Every month that it fails to expand, it resembles less the conquering state of the Prophet and more like another Middle Eastern government failing to bring prosperity to its people. While it is still receiving significant financial support from sympathisers outside of Iraq and Syria to expand its war effort, many of the Gulf oil states that are giving money are doing so to prevent it from invading their territory. Ironically the biggest proponent of an American invasion is the Islamic State itself. If America were to be drawn into a ground fight it would be a huge propaganda victory for jihadists worldwide and would massively bolster recruitment, through claims that the United States was embarking on a modern-day Crusade to kill Muslims. Graeme Wood predicts that the Islamic State will eventually become hamstrung by its radicalism. It has no allies and the land it controls is mostly uninhabited and poor. If it stagnates, its credibility as the engine of God’s will and the agent of apocalypse will weaken. Fewer believers will arrive, and the movement will be discredited. There is also discord within the Muslim world over the authenticity of the caliph. While Baghdadi is a jihadists Salafi (a branch of Sunnism), most Salafis are not jihadists and most reject the Islamic State. While these Quietist Salafis are committed to expanding Islam, they believe that Muslims should not divide one another. They do not believe that God anointed Baghdadi saying that a caliph could only arise out of a consensus of scholars from Mecca and Medina. The Islamic State’s ambitions and strategy were spelt out in social-media chatter as far back as 2011, when it was just one of many terrorist groups in Syria and Iraq. Followers were told that the group’s ambition was to “restore the Islamic caliphate”. Baghdadi had already styled himself as “commander of the faithful,” a title ordinarily reserved for caliphs. Foreign fighters who’d heard their message began joining their ranks. When the caliphate was declared, the number of recruits escalated – thousands of foreign Muslims from France, the United Kingdom, Belgium, Germany, Holland, Australia, Indonesia, the United States, and even New Zealand are thought to have immigrated to the Islamic State. Many have gone to fight, and some intend to die. “There is an international coalition, led by the United States, which is said to be dedicated to the destruction, or, at least ‘containment’ of the Islamic State threat. So the question for New Zealand is, should we join this coalition? We are talking here of many of our traditional allies and security partners. The international coalition of 62 nations opposing the Islamic State already has a sizeable contingent of troops in Iraq including 3,000 from the US, 700 from Canada, 600 from Australia, 300 from Spain, 280 from Italy, 250 from Denmark, and Britain will soon have 2,000. Most personnel are involved in training the Iraqi Army, which is estimated to have 250,000 troops, plus armed police, while others are engaged in airstrikes. As of February 17, the coalition – mainly the US and Britain – had carried out 1,383 airstrikes in Iraq and 1,094 in Syria. Some estimates put the Islamic State’s armed forces at over 100,000, including over 20,000 foreign fighters. Their internet recruitment campaign using social media to connect young radicalised Muslims with jihadists in Syria and Iraq is said to have overtaken Al-Qaeda in its effectiveness. The threat to humanity and world peace posed by the Islamic State cannot be underestimated – especially if they gain the allegiance of al‑Qaeda. Anyone who believes in human rights should surely support the international coalition in their attempt to help contain and defeat them. Do you support New Zealand sending troops to Iraq to support military action against the Islamic State? Remaining indifferent is not going to assist anything. This action may not achieve anything but at least we think that we are trying.